Ultimately, the Court ordered Defendant to pay attorney fees in the amount of $219,192 and prejudgment interest at the rate of 9%. The decision was significant because of the Court’s detailed analysis of the Supreme Court’s decision in Hardt v. Reliance Standard Life Ins. Co., 560 U.S. 242, 130 S.Ct. 2149 (2010) and the five factors specified in Chambless v. Masters, Mates & Pilots Pension Plan, 815 F.2d 869 (2d Cir. 1987). In Hardt, the Supreme Court emphasized that a fee claimant need not demonstrate it is the “prevailing party” to be eligible for an award. 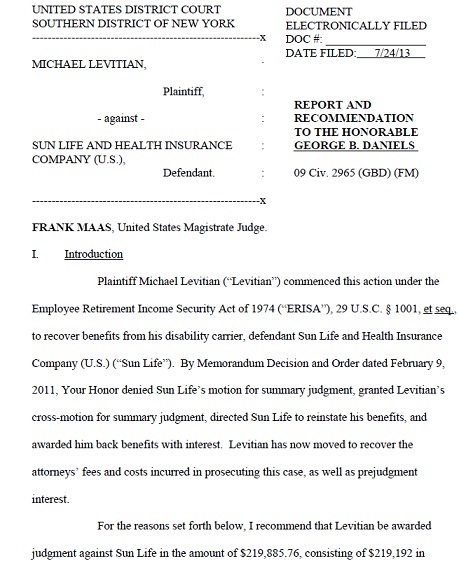 Rather, the claimant need only show he achieved “some success on the merits.” Because Levitian prevailed in both the District Court (for a copy, click here: Download file) and the Court of Appeals (for a copy, click here: Download file), there was no question that Levitian was the prevailing party, and thus eligible for a fee award. (1) the degree of the offending party’s culpability or bad faith, (2) the ability of the offending party to satisfy an award of attorney’s fees, (3) whether an award of fees would deter other persons from acting similarly under like circumstances, (4) the relative merits of the parties’ positions, and (5) whether the action conferred a common benefit on a group of pension plan participants. The Court easily found that the balance of the five factors supported the award of attorneys' fees. This is despite the fact that Sun Life vigorously argued that the five factors weighed against the award of attorneys' fees. The Court’s discussion of two of the factors (1 and 2) was the most interesting. With respect to the first factor (the degree of Sun Life’s culpability), Sun Life argued that a finding that its determination was arbitrary and capricious (which both the District Court and Court of Appeals found Sun Life’s determination to be) cannot be enough to satisfy the factor because in almost every case under ERISA, that is the standard that must be satisfied to prevail. If that were the case, Sun Life argued, then attorneys' fees would be awarded each time that a plaintiff prevails. The general standard of review for an administrator's decision is de novo review. Id. Since Sun Life required Levitian to overcome a higher hurdle to prevail on the merits of his claim for disability benefits, it can scarcely argue that his success in doing so should not be considered evidence of Sun Life's culpability. In all, the decision was a big win for the plaintiff, discouraging insurers from arbitrarily denying valid disability claims.